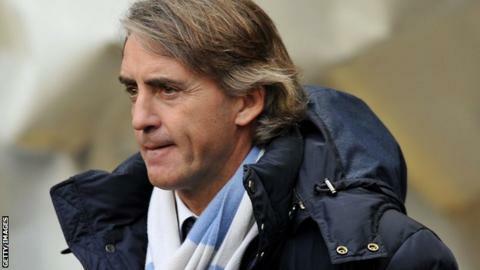 Manchester City boss Roberto Mancini says he is currently "the best manager in England" and is not facing the sack. City are out of European competition and face a battle to retain their Premier League title, with Manchester United currently 12 points clear. They are in the FA Cup quarter-finals but former City player Danny Mills has suggested Mancini will be replaced at the end of the season. "In the last 15 months I am the best manager in England," said Mancini. Mancini took over at Manchester City in December 2009, replacing Mark Hughes. "When you look at what he has spent in the last three seasons, £285m on players, that alone means you are under pressure to succeed. The owners want to win the Premier League again and you have to be competitive in the Champions League. "I think he may well go (even if he wins the FA Cup), depending on who is available. Manchester City are looking to play the Barcelona way - they have brought in those guys. There are lots of rumblings, it is not always a particularly happy dressing room and when you have spent that amount of money there is pressure. What we haven't seen this season is any progression.
" A lot of people want Mourinho at the moment and Mancini's job could depend on who is available and who they can get. Guardiola has now gone, you assume there will be a position at Chelsea and after the weekend, who knows what Arsene Wenger may do." In his first full season in charge, the Italian led his side to third in the Premier League and Champions League qualification. Last season Manchester City closed an eight-point gap on United to win their first Premier League title with a dramatic 3-2 final day win over Queen's Park Rangers. But this season his side have been left behind by United in the league and they also exited the Champions League at the group stage, finishing bottom of Group D and failing to win a match which also meant they failed to qualify for the Europa League. There has been some restructuring behind the scenes this season, with former Barcelona technical director Txiki Begiristain appointed as director of football and speculation about Mancini's future has been growing. Reports linked former Barcelona manager Pep Guardiola to Mancini's job, but the Spaniard has joined Bayern Munich. Real Madrid manager Jose Mourinho, who last week said his next job would be in the Premier League, is now being touted as a possible replacement for Mancini. After Sunday's 4-0 FA Cup victory over Leeds, Mancini said: "Someone says for six months that Manchester City would change manager, Guardiola would come in, and after Guardiola went to Bayern Munich, now another manager. "I won one Premier League, one FA Cup, one charity shield, there is not another manager that's won like me in the last 15 months. "I can do nothing but it is the reality." Meanwhile, Mancini feels Sergio Aguero is key to reviving their Premier League title hopes after the Argentine scored twice in City's fifth-round win against Leeds. "I hope Sergio will be like this until the end of the season," said Mancini. "If Sergio is like this and our strikers continue to score a lot of goals from now until the end, the championship is not finished."